The Organizing Committee cordially invites you to attend the 26th North American Catalysis Society Meeting (NAM26) that will be held from June 23 – 28, 2019 in Chicago, IL. This biennial meeting is widely recognized as the premier topical conference for matters related to homogeneous and heterogeneous catalysis, while also including broad coverage of homogeneous catalysis, electro-catalysis and photo-catalysis. Quoted from his obituary, "Garry received his B.Sc. and Ph.D. from the University of British Columbia, Vancouver, British Columbia in 1968. After a NATO Postdoctoral Fellowship at Imperial College, London, U.K., Garry joined the University of Waterloo in 1969 as an Assistant Professor and rose to the rank of Professor in 1980. Garry was Chair of the Department of Chemical Engineering from 1988 to 1996. 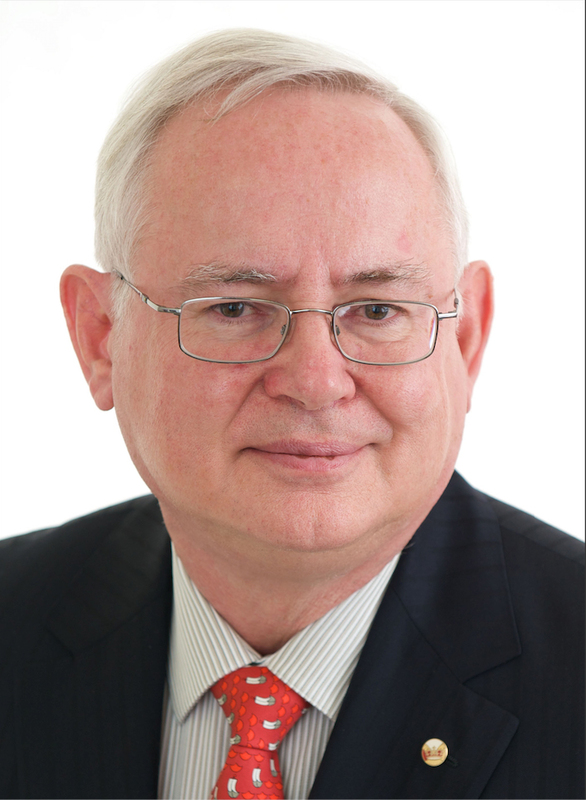 Garry’s research expertise is in the area of applied catalysis, polymer science and engineering. In 2004, he received the prestigious title of University Professor. During his tenure at the University of Waterloo, Garry received numerous awards and recognitions for his academic achievements and contribution to science and engineering. His long list of accomplishments includes: Fellow, The Royal Society of Canada (1992), Vice-President, The Royal Society of Canada (2001-2003), President, Academy of Science, The Royal Society of Canada (2001-2003), and the Queen Elizabeth II Jubilee Medal (2013). In 2015, Garry was appointed to be a Member of the Order of Canada for contributions in education, research and industry in Canada. Garry is a mentor, teacher and friend to many students and colleagues in Canada and internationally. He will be greatly missed." For Obituary of Garry Rempel and funeral information, go to Obituary and Funeral. Please submit the applicant information by filling the form in the document and sent it to Professor Natalia Semagina before the deadline. Her email address is semagina@ualberta.ca. The Division encourages submissions from Canadian colleagues. The details of the nomination procedures can be found from the websites given below. The Division encourages you to consider nominating your colleagues who deserve the awards. 2)	the Michel Boudart Award for the Advancement of Catalysis. The 25th Canadian Symposium on Catalysis has been successfully held in Saskatoon's Delta Bessborough Hotel from May 8 to 11, 2018. The symposium attracted 125 attendees from Canada as well as China, USA, Singapore, India and countries in Europe. "We tried our best to deliver an inspiring, enjoyable, and friendly conference," said the conference chair, Professor Hui Wang of the University of Saskatchewan at the beginning of the symposium. The technical program included not only plenary and keynote lectures by top catalysis researchers in the world but also brilliant presentations by graduate students and postdoctoral fellows. The symposium covered eight parallel sessions addressing fundamental and applied catalysis researches concerning environment and sustainability, materials, conventional and renewable energy, explained the technical program chair of the symposium, Professor Robert Scott, who is also from U of S. The theme of the symposium is "Shining the Brightest Light on Catalysis." The Canadian Light Source had a Town Hall in the symposium sharing with the participants what the synchrotron technologies at CLS can help in catalysis research and the participants also asked further technologies they want to see at CLS to meet their research needs. In order to help participants enjoy the symposium as much as possible, the organizers provided breakfast and lunch while maintained low registration fee and free registration for most the Canadian students. Organizers. 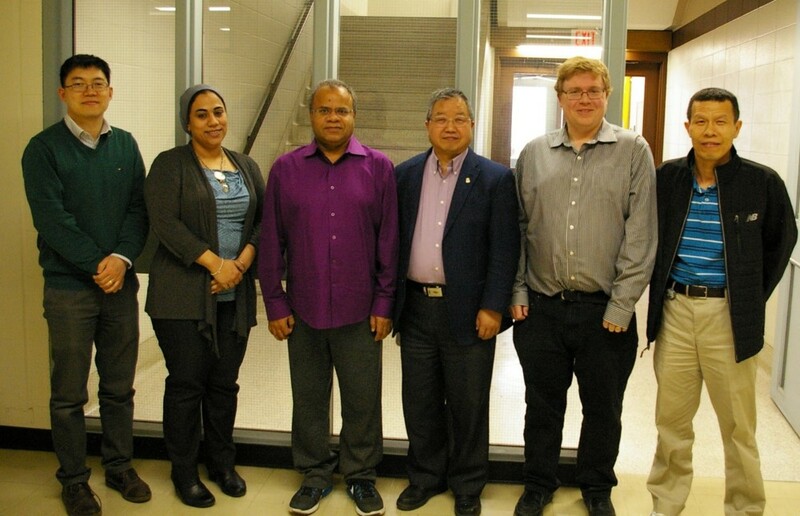 From left: Dr. Lifeng Zhang, Dr. Amira Abdelrasoul, Dr. Ajay Dalai, Dr. Hui Wang, Dr. Rob Scott, Dr. Yongfeng Hu. 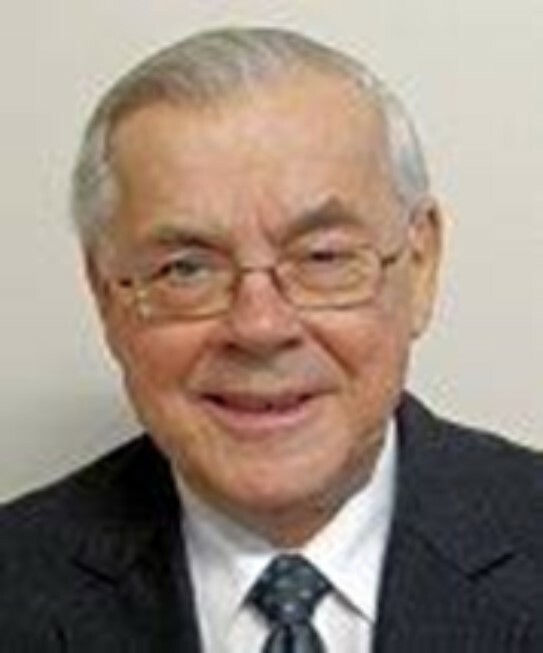 A Co-founder of the Canadian Catalysis Foundation and the recipient of 1994 Catalysis Medal of The Catalysis Division, Chemical Institute of Canada, Professor Emeritus of the University of Alberta, Dr. Ivo G. Dalla Lana passed away on March 5, 2018. Ivo Dalla Lana was born on 5 July 1926 in Trail, B.C. He received his Bachelor of Applied Science degree from the University of British Columbia. During 1948-51 he worked as an engineer in the Research and Development Department of Cominco Ltd. 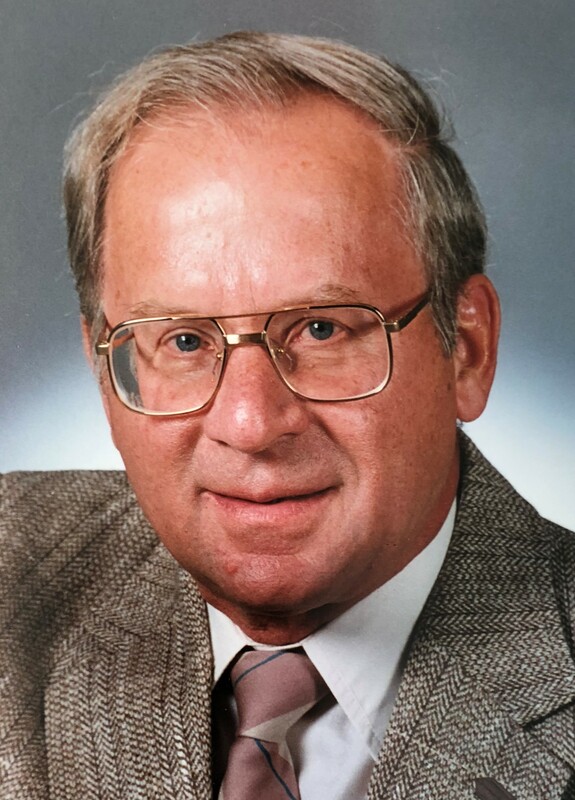 In 1953 he received his Master of Science degree from the University of Alberta and in 1958 he received a Ph.D. degree from the University of Minnesota, with a major in chemical engineering and minor in physical chemistry. From 1958 until his retirement in 1992, Dr. Dalla Lana was a professor in the Department of Chemical Engineering at the University of Alberta. During that time he supervised graduate work on 20 M.Sc. and 7 Ph.D. theses and collaborated with 25 postdoctoral fellows who participated in research programs that he initiated. This work resulted in over 100 publications and research reports, and a number of patents and patent applications. Dr. Dalla Lana’s retirement did not interrupt his research activities which continue with unweakened energy, valuable experience and knowledge. Since his retirement, he has supervised research projects supported by three NSERC strategic grants: one NSERC operating grant and two industrial grants concerning olefin polymerization. His research group is truly an international one and his collaboration in the field of catalytic research involves five catalytic groups in different European countries. He was a visiting professor at the University of Bath, England, at Fritz-Haber-Institut der Max-Planck-Gesellschaft in Berlin, Germany (twice), and at Atomic Energy of Canada in Chalk River, Ontario. He delivered a number of invited lectures both in Canada and abroad, and he was also a keynote speaker. The Association of Professional Engineers of Alberta nominated him as a life member and The Chemical Institute of Canada nominated him as a fellow. Over ten scientific periodicals, publishing papers in the field of catalysis and chemical engineering, have asked Dr. Dalla Lana to referee submitted manuscripts. The Natural Sciences and Engineering Research Council nominated him a member of various committees and the Ontario Council of Graduate Studies invited him as a consultant for appraisal of a Ph.D. program. Due to his comprehensive knowledge of catalysis, he served as a consultant with a number of companies in Canada, and as an expert witness in a court case involving patent litigation in the United States of America. Dr. Dalla Lana devoted much time to professional societies such as: 1) the Canadian Society of Chemical Engineering serving as director and secretary on the national executive and chairman of the local executive, 2) The Chemical Institute of Canada serving as a regional counsellor for Alberta and Saskatchewan, 3) The Catalysis Division of The Chemical Institute of Canada serving as national chairman and a founding member of its executive, 4) the 9th International Congress on Catalysis serving as vice-chairman of the organizing committee, and 5) The North American Catalysis Society serving as Catalysis Division representative. The main areas of Dr. Dalla Lana’s research activities include: 1) utilizing infrared spectroscopy to study adsorption and surface reactions (since 1967; has been successfully applied to several industrial catalytic reaction systems), 2) sulphur recovery technology, primarily based on the modified Claus reaction, which made him an internationally recognized expert in this field, and 3) ethylene polymerization on supported chromium catalysts in slurry reactors and oligomerization of ethylene in a solution reactor (since the mid-1980s). The Organizing Committee of the 25th Canadian Symposium on Catalysis has begun their call for abstract submission. Graduate students from Canadian universities can also submit their application for the student conference support (awards) by the Canadian Catalysis Foundation at the same time. Please visit the conference website http://www.catalysisdivision.ca/symposium for details. The deadline for submission is December 15, 2017. The 67th Canadian Society of Chemical Engineering Conference in Edmonton, Alberta in the end of October 2017 had an honorary symposium to celebrate Professor Sieg Wanke’s 41-year-long career in not only catalysis research but also chemical engineering education. Dr. Wanke received his B.Sc. and M.Sc. at University of Alberta (U of A), and his Ph.D. from University of California Davis. He joined the then called Department of Chemical and Petroleum Engineering at U of A in 1970. 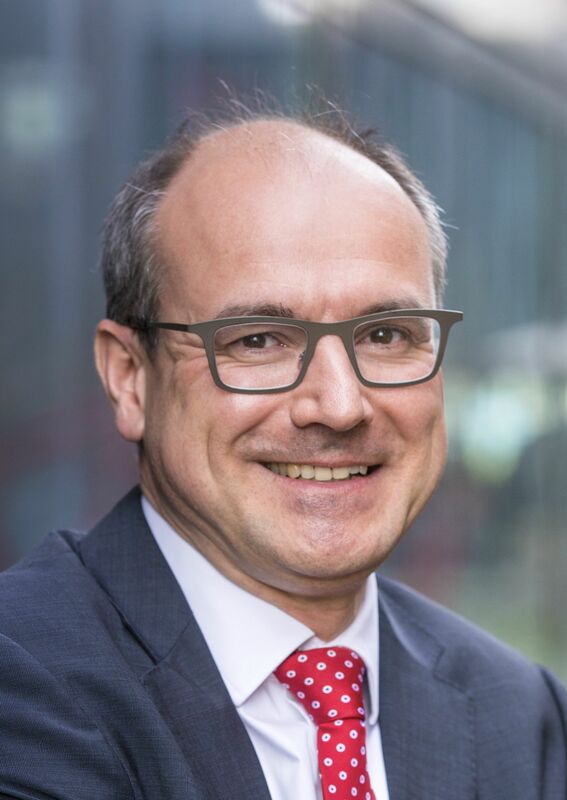 Professor Wanke’s research area covers reaction kinetics, heterogeneous catalysis and reactor modelling. The presenters in the symposium addressed many significant and influential contributions he has made with publications, patents, and conference and invited presentations. Professor Wanke served more than 13 years as Department Chairman and introduced the first catalysis course in the department. He has also been awarded several distinguished prizes during his career, including a Max Planck Gesellschaft Fellowship (1981-82). He is now a professor emeritus in the Department of Chemical and Materials Engineering at U of A.
Prof. Bert Weckhuysen of University of Utrecht (The Netherlands) has been chosen as the 2018 R.B. Anderson award winner. Professor Weckhuysen received both his master and PhD degree from Leuven University (Belgium) in respectively 1991 and 1995. Since October 1, 2000, he has been a Full Professor of Inorganic Chemistry and Catalysis at Utrecht University (The Netherlands), where he has recently been appointed as a Distinguished Professor. He has authored or co-authored more than 460 publications in peer-reviewed scientific journals, which have gathered more than 19,400 citations. His research interests include the development and use of in-situ and operando spectroscopic methods (including synchrotron methods) for heterogeneous catalysts in order to develop relevant structure-activity relationships for catalytic processes, catalytic conversion of biomass to fuels and bulk chemicals, synthesis and characterization of ordered (micro-) porous materials with catalytic potential, and the molecular design of transition metal ion complexes in inorganic hosts for catalyst applications. The awardee will present two lectures at the Canadian Symposium on Catalysis in Saskatoon on May 8-11, 2018. The Catalysis Division of the Canadian Institute of Chemistry has chosen its new Executive Committee for the 2016-18 term in its annual general meeting during the Canadian Symposium on Catalysis which was held in Ottawa, Ontario from May 8 to 11, 2016. Professor Tom Baker of the U of Ottawa become the chair of the committee for this term. He thanked the past chair, Professor Josephine Hill of the U of Calgary for her tremendous contribution foe the Division in last two years. Tom was also thanked for the success of organizing the symposium of 2016.